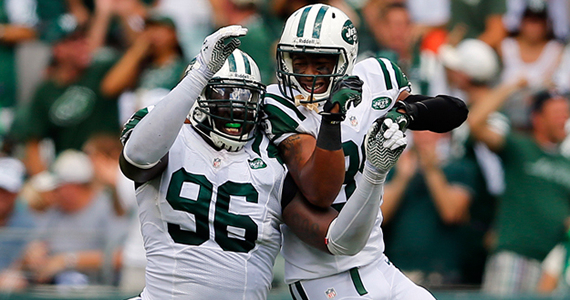 Big League Clu kicks off the 2013 Jets season with a review of Week 1. 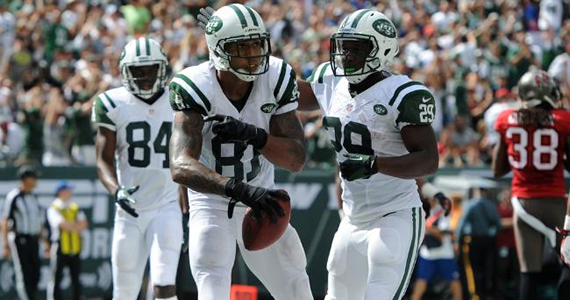 We begin our weekly review of the New York Jets with quite the game, huh? The J-E-T-S Jets Jets Jets weren’t the most graceful team on the field, but hey, they fought all game, never gave up the huge play and managed to squeak out an 18-17 victory over the Tampa Bay Buccaneers. So lets take a look at what happened this past sunday ah? You heard it correctly. 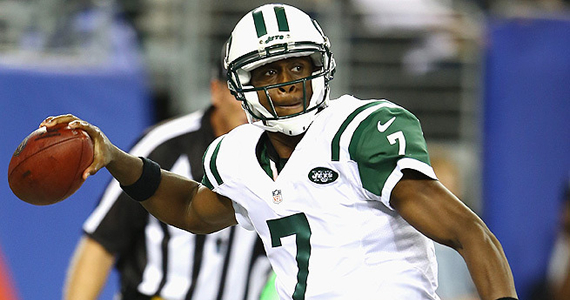 Rex decided to let rookie QB Geno Smith start under center for week 1. So, how did he do? Not half bad, to be honest. He made some rookie mistakes, which happens, but there were some positives to take away from his first game as starting QB too. 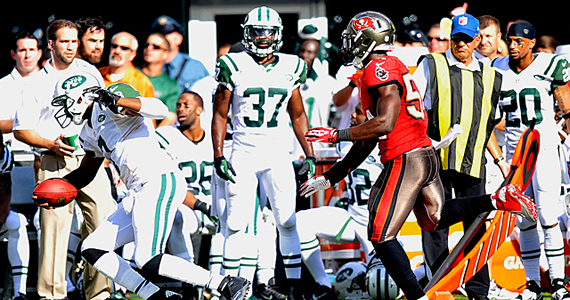 Smith brought a dynamic to the Jets offense that had not been seen in a while; Mobility! He made some good plays with his feet, and also some key passes when he needed to. Smith’s stat line went as followed: 24 of 38 passing, 1 fumble, 1 interception and 1 passing touchdown. He also lead all Jets rushers with 47 yards. Again, these are not amazing numbers, but Geno helped keep the Jets in the game. I am sure, however, that Smith, Rex and Offensive Coordinator Marty Morhinweg will be going over his mistakes before they take on the Patriots this Thursday night. This is where I have to give kudos to Head coach Rex Ryan. He has built himself a nice defense, which is, essentially, what is going to make this team look somewhat credible this year. The Jets front seven only allowed Bucs rusher Doug Martin to run for 65 yards on 24 carries (2.6 yards per carry), and they even forced fumble out of him. They also sacked QB Josh Freeman 3 times, intercepted him once, only gave up one TD and forced a safety early on in the game. Their defense gave up only 250 yards total offense. No Revis? No Problem. Muhammad Wilkerson, Calvin Pace and David Harris stepped up to help keep the Jets in the game, but lets not forget that they also got some key contributions from rookies Sheldon Richardson (assisted on a sack) and Dee Miliner (solo tackle, 1 assist). They also managed to not give up the HUGE play against Tampa Bay. Yes, Bucs wideout Vincent Jackson had a monster game with 154 yards receiving, but again, only two touchdowns were allowed. The Jets defense was definitely a very big factor in keeping the team in this game. This is the part where I give thanks to all of the penalties and sloppy play that made this Jets win possible. First I’d like to thank QB Josh Freeman for that fumble in the end zone. I’d also like to thank him for then kicking the ball out of the back of the end zone, which which resulted in a penalty and a safety. Next, I would like to thank the Bucs for all 13 of their penalties, and the 102 yards they helped the Jets gain.. That certainly didn’t help the cause for Tampa! But lastly, I want to give a special thanks to Bucs linebacker Lavonte David, because he was primarily responsible for Tampa losing that game. After Kicker Ryan Lindell had put the Bucs up 17-15 with a late field goal, Jets get the ball back with under 30 seconds left in the game. Smith, trying to mount his first professional comeback, drove downfield to get the offense into field goal range. On the second-to-last play of the game, Smith took off scrambling for a first down towards the sidelines, when David made a bonehead mistake and shoved Smith while he was out of bounds. That was good enough for a 15 yard unnecessary roughness penalty, it put the Jets in much more comfortable field goal range. 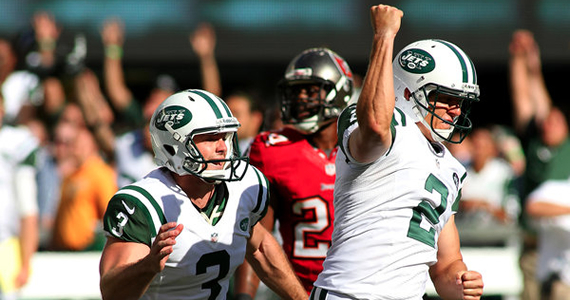 On the next play, my hero Nick Folk kicked the game winner. Jets win, 18-17. Yes, Gang Green squeaked out a win. Were they dominant? Absolutely not, and with the short week to work on their mistakes, I am not at all confident that they could go into Foxboro and upset the Pats on Thursday night. I liked what I saw from new acquisition Kellen Winslow, and hope that he will be used more in the Jets new offensive scheme. I feel he might be key for any sort of success on the offensive side of the ball for the Jets. Let’s see what Geno and the Jets have in store for us Thursday night.